Hello and welcome! 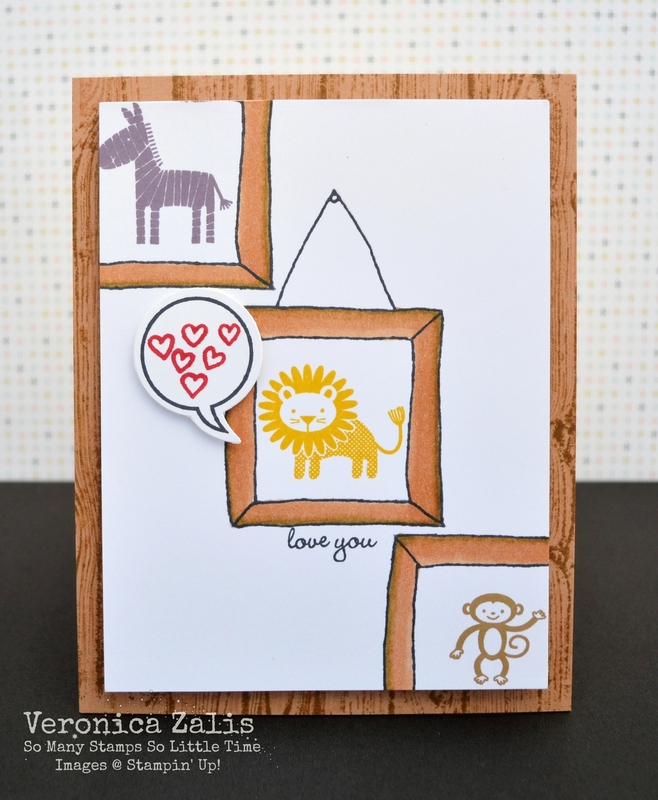 "Zoo Babies" by Stampin' Up! is one of the cutest sets in the catalog, now pair that set with the SU photopolymer stamp set "Sweetie Pie Frames" and you have instant cute overload! I stamped my frames using Memento Tuxedo Black, and colored them with alcohol markers. I stamped the zebra, lion, and monkey using Wisteria Wonder, Crushed Curry, and Baked Brown Sugar. I used the Hardwood background stamp to create my card base. I used the SU Just Sayin' stamp set and covered up the inner sentiment before inking the stamp. Then I removed the tape and stamped the word bubble. The heart stamp from Sweetie Pie Frames fits perfectly inside the word bubble. I love discovering stamp sets that coordinate with each other! I am glad you stopped by, and I hope I gave you a little inspiration along the way. oh my word how adorable.. love those fun frames and those little animals are too cute.. love it..
Oh Happy Day - Playing With Stampin' Up! Paper Smooches May Guest Designer! Thinking Of You Using Altenew! Gettin' Foxy With Life In The Forest!